The Official Mort Künstler Blog: For Us the Living: The Civil War Art of Mort Künstler moves to North Carolina! For Us the Living: The Civil War Art of Mort Künstler moves to North Carolina! On Saturday, Sept. 14, from 11 a.m. to 3 p.m., Künstler will sign prints of “Capitol Farewell” in the Museum Shop, the first venue to have these prints featuring the North Carolina State Capitol. (Signed items are limited to two per person.) In addition, items related to the painting “Winter Riders,” books, and other Künstler memorabilia will be available for purchase. 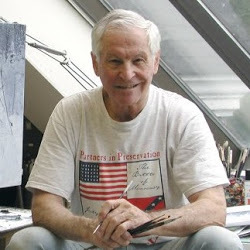 Nationally acclaimed artist Mort Künstler has been painting captivating scenes of American history for more than 50 years. Known to many as “America’s artist,” he has focused on the Civil War almost exclusively since the 1980s. An upcoming exhibit at the N.C. Museum of History in Raleigh will showcase original paintings by the renowned artist. For Us the Living: The Civil War Art of Mort Künstler will open Friday, Aug. 23, and run through Jan. 5, 2014. This free exhibit will be significant for two reasons. First, Künstler has selected 33 original paintings from his personal collection for the exhibit. Second, he has recently announced that he will only produce eight more Civil War-era paintings before moving on to other topics. “One of these Civil War paintings, titled ‘Capitol Farewell,’ will be unveiled especially for the exhibit,” said Museum Director Ken Howard. “The North Carolina State Capitol is prominent in this winter scene of a young couple saying good-bye during wartime.” “Capitol Farewell” is one of two paintings by Künstler of the Raleigh landmark as it appeared on Feb. 5, 1863. The first such painting is “Winter Riders” (1995). Künstler’s exceptional talent lies in his ability to tell a story dramatically and realistically, from scenes of raging battles to a soldier’s private moments. Viewers often get the sensation that they are looking back through time at the real event. “Künstler strives to make each Civil War scene as authentic to the event as possible,” adds Howard. With painstaking attention to detail, the artist researches the uniforms, guns, buttons and other gear. He often visits the locations depicted in his paintings and tracks down an event’s weather conditions when possible. Each painting in For Us the Living is accompanied by text in Künstler’s own words. He describes the inspiration for a scene or the historical event behind it. The paintings in For Us the Living cover a variety of topics. A sampling of titles from the exhibit follows. ● “First Shot at Fort Sumter: P. G. T. Beauregard at Charleston Harbor,” Charleston, S.C., April 12, 1861. ● “The Gunner and the Colonel,” Battle of Fort Fisher, N.C., Jan. 15, 1865. ● “A Fleeting Moment,” Stonewall and Mary Anna Jackson, Winchester, Va., Feb. 1, 1862. ● “The Angel of the Battlefield,” Clara Barton with Walt Whitman at Chatham Plantation, near Fredericksburg, Va., December 1862. Come see these paintings and others that illuminate fascinating individuals and historic events through the eyes of a distinguished Civil War artist. Prints of “Capitol Farewell” are available for purchase in the Museum Shop for $225.00. Call the shop at 919-807-7835 to reserve your print. opportunity. If you are interested in Civil War history, I recommend that you go see this exhibit as part of the Civil War Sesquicentennial.